The Emerald Isle had long been a place both of us wanted to visit. My ancestors, the Butlers, originally immigrated to North America from Ireland sometime in the late 1600s and I had always been anxious to someday roam the lands of my ancestors. Anne had done extensive European traveling for her studies, but never managed to make it to the Celtic Paradise. After popping the question and her subsequent acceptance, we knew we wanted to do something special and unique for our honeymoon, but resigned ourselves to the difficult financial reality that we may be limited to attending a Dolly Parton concert in Gatlinburg or simply retiring to our house and opening a bottle of three-dollar wine. Anne and I have been fully functioning adults for quite some time before we decided to wed. I, at 32, was already a homeowner and possessed all the necessities required for bachelor survival (such as beer steins, video game systems, and several vintage 1970s Star Wars figurines). She, at 29, had accumulated several apartments’ worth of dishtowels, linens, and silverware. When we did combine our belongings for our impending union, we ended up having two of almost everything and had to make use of yard sales and needy friends to prevent our house from being cluttered to the point of non-livability. Initially, registering for our wedding proved to be a challenge. We had no use for another coffee machine, crock pot, or anything else that many couples just starting out seem to request. We toyed with the idea of simply asking our guests to bring cash to the wedding and throwing it in a bucket by the altar, but we both agreed this was somewhat tacky. Then, about a month after the proposal, Anne stumbled upon Traveler’s Joy. 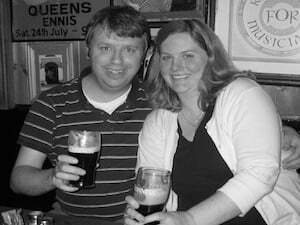 Immediately, thoughts of an Irish honeymoon filled our heads and it didn’t take us long to decide that Traveler’s Joy was the way we wanted to ask our friends and family to bless our forthcoming wedding. So, we calculated that the total cost of our dream honeymoon (airfare, accommodations, entertainment, etc.) would be $2,500 for a week in Ireland. We spent several nights deciding our itinerary and opened a Traveler’s Joy account detailing our travel wishes. We also set up a wedding website, provided a link to our Traveler’s Joy page in our registry, and shared our wedding website on Facebook, through e-mail, and on an insert with wedding invitations. As soon as we shared our Traveler’s Joy account, the gift notification e-mails began flooding Anne’s inbox. Within a month of opening our account, we had enough to book our airline and accommodations. 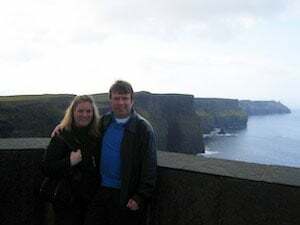 By our March 20, 2010 wedding date, it became clear that we were going to be able to experience everything in Ireland we requested through Traveler’s Joy. The night of our wedding we stayed in a luxury hotel in our hometown of Chattanooga, Tennessee, then immediately drove to the Atlanta airport the next morning to begin our Irish odyssey. After what seemed like an eternity, we arrived in Dublin, Ireland the morning of March 22. We checked into the Arlington Hotel in the Temple Bar district and set off to see the city through the Viking Boat Tour, the first of the numerous requests fulfilled through Traveler’s Joy. After a couple hours of riding around in a World War II era amphibious vehicle wearing a plastic Viking helmet screaming at pedestrians, we went back to our hotel to nap away the jetlag. After a brief nap, we proceeded to the Guinness Brewery at St. James Gate. Irish folklore states that in 1759, God gave Arthur Guinness the idea for the greatest drink in the world to give the Irish something to do besides conquering the earth. While an Irish dominated world would have its advantages, the divine intervention preventing such an event was also beneficial to the world for the happiness such a product would bring. After learning many interesting facts regarding this holy nectar, we ate a traditional Irish dinner, listened to some traditional Irish music, and then went to sleep in order to prepare for our adventure the next day. After a relatively short bus ride from Dublin, we arrived in Kilkenny around lunch time and checked into a lodging establishment known as the Butler House. The Butler House is a hotel on the grounds of Kilkenny Castle, which was the seat of medieval power in Ireland. The hotel was named after the Butler family, my direct ancestors who, from the middle ages until the conquest of Oliver Cromwell ruled the land justly and with a firm hand. Touring the castle with my new wife was an incredible experience. All my life I had heard from my father about how our ancestors were Irish nobility and here I was, finally in my ancestral home staring at their paintings. This experience will never be forgotten and was made possible by Traveler’s Joy. After soaking in all the family history, we went to the city center for some drinks, music, and fun before retiring to our room to prepare for the next adventure. The next day, a trip to County Cork was on the schedule. After a brief visit and lunch in Cork City, we proceeded to the legendary town of Blarney. Blarney, as may know, is the home of the legendary Blarney Stone, the magical rock in the wall of Blarney Castle that provides one with the gift of eloquence and gab. It was here where Anne and I cheated on each other for the first and only time, as both of us initiated a hot make out session with the rock of legend. Despite the terror caused by being dangled off the edge of the castle by a man making the European equivalent of minimum wage, the experience of kissing the stone was something that will stay with us for time eternal. After waking up to a traditional Irish breakfast of such delicacies as rashers and blood pudding, Anne and I headed to County Clare and split the day between the towns of Ennis and Doolin. Ennis is the administrative center of the county, and while there we toured a museum and learned of the exploits of Brian Boru as the first High King of Ireland, who originated in the area. After a delicious lunch and several pints of Guinness, we caught a bus to Doolin. The village of Doolin is known for its traditional Irish music, however we arrived on an off night and were relegated to sitting in a pub with another American couple while we watched their young son rearrange chairs and spit in his mother’s drink. Still, it was a very rich experience. We ended up staying above the pub in a rustically charming room as a way to experience the fullness of rural Ireland. When the misty Doolin morning broke, Anne and I walked the village, enjoying scenery that looked like something from a Tolkien novel before yet another traditional Irish breakfast. After eating, we caught a taxi to the Cliffs of Moher, driven by a friendly cabbie who was actually friends with the owner of one of my favorite Irish bars back in Tennessee. The scenery of the Cliffs of Moher was unlike anything I had ever witnessed, and the beauty of that location set the tone for what I believe will be a beautiful life together with my new wife. After the Cliffs of Moher, we began the long bus ride back to Dublin to prepare for our flight back to the United States the following morning. While this was a somewhat lengthy trip, the many hours we spent on the bus traveling from one coast of Ireland to another allowed us to view the Irish countryside in a way that many outsiders would never think and gave us a fuller appreciation for the way Irish cities are put together, consolidated and seemingly walkable when viewed through a bus window, in contrast to the US. As dusk slowly consumed the island, we arrived at the main Dublin bus station, caught a taxi to our hotel near the airport, ate one last Irish dinner, and concluded the greatest adventure either of us had ever experienced, arriving back in the US on the evening of March 27. It is safe to say that Traveler’s Joy contributed greatly to our marriage by providing us with an avenue to finance our dream honeymoon and make our friends and families feel a part of the incredible first adventure Anne and I had as husband and wife. I would definitely highly recommend the service to any couple looking to start off their lives together with something more memorable than a new microwave oven, and I will be eternally grateful to Traveler’s Joy for making such an epic adventure possible.